As we all know, there are a million and one jobs around the yard that need doing on a daily basis (or so it seems). We tackle what we can as time allows, but some little odd jobs always slip our to-do list. Haynets – fix holes where possible, throw if beyond useless. Buckets – fix breaks if you can, again throw if they don’t actually hold anything anymore. Water supply to field – does it leak anywhere? Pipes/hose – fix any leaks with duct tape, or call a plumber if your pipes are beyond patching up! Hay/straw/bedding – do you need to order any more? Is it stored in a dry place? Doors – are the bolts all still attached? Do you have any escape risks? Feed – check supply levels, order more if needed. Are you storing it in an appropriate place? (i.e dry, not accessible by pests or hungry horses). Sweep yard thoroughly. Wet it and give it a good old scrub with a rough brush. Empty out grooming kit – throw away empty bottles of shampoo etc, check that no brushes are broken, that you have everything you need in it (no wandering hoof picks etc). If you have a horsebox, check that its documents are all up to date (MOT, insurance, tax). Fill out your horsey calendar with dates for the diary – eventing/competing dates, when wormer/vaccinations are due etc. Treat yourself to a glass of your favourite tipple – you’ve certainly earned it! 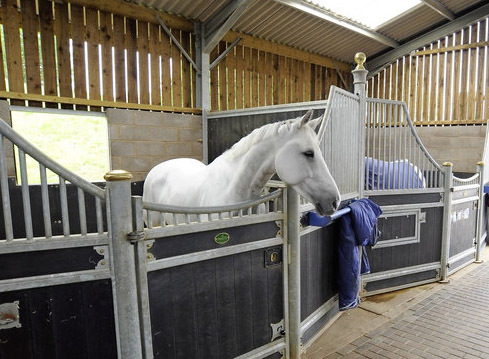 For more of this year’s spring cleaning series, follow the links to check out the previous articles on cleaning your tack, sorting out your tack room, caring for your horse’s rugs and giving his stable a thorough mucking out.